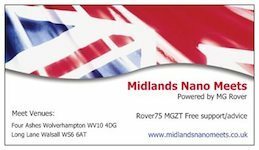 Forums » General Chat » Rover 75 and MG ZT Forum » What should I be looking out for . . .
. . . on a 60K mile Diesel 75? That it has 60K on the clock and is a diesel? thermostat quickly up to temp and Alternator charging correctly, both a absolute pig of a job seemingly. Check the cooling fan runs ( select demist inside the cab and with ign on, fan should run). If a manual check the operation of the clutch. If twin fuel pumps make sure one at rear is running, listen under rear seat on startup. Other than the normal MGRoverbits not a lot. The EGR (Exhaust Gas Recirculation Valve) should have been bypassed or had a thorough clean out. PCV (Positive Crankcase Ventilation Valve) is often missed by many but a simple thing to change. Try to get a car with under bonnet fuel burning heater FBH (Fuel burning heater.) helps with running costs on winter mornings. My diesel has now covered over 145,000 miles with very few problems. If all the correct service items are done they just keep on running. To make Diesels run well with good MPG have a custom remap or a synergy or both for 170BHP. See off most things when required and a great car for towing. Go to view it first thing in the morning , check to see if it has been pre started. If manual when you let out the clutch gently without using the throttle, it should pull away smoothly no stall, stutter, or judder. Do not forget the little things that can add up to a lot. Check that the door mirrors work in all directions. Check hot air comes through all 4 dash vents, and it is not cool on the N/S. Take a flask of coffee and have a cuppa while you look at it, if a tourer open the rear window and hold the cup to it to see if the elements have burned out. Try all windows from the switches on all doors. Check that the locking works with BOTH keys, or nock the cost of a key off the price. If electric seats, check heater elements and all switches work. Check the jacking rubbers are all there. Take up all the mats and have a close nose for water ingress. Check for a paddling pool in the plenum chamber. Check washers and wipers. Pull the car forwards a few feet, dip clutch and stop the car with the handbrake if one side of the car raises more than the other, the handbrake is not holding the wheel on the side that dores not raise. If it needs new tyres the seller obviously feels the car is not worth buying tyres for. At least 3 months MOT. Check under the spare wheel for water. Turn on ign and air con, and check if fan is working. Blah Blah that will do for now. Right, lots to digest there then May be looking at one tomorrow . . .
Something to remember. Low mileage, doesn't mean perfection. It may have spent it's life doing school runs or similar, even as a diesel, so check the brakes, steering, tyres and springs. Not saying they will be problems, but they will have been used more than you might expect on a low miler. My sub 40k car had really ropey brake discs and a broken rear spring. Went to have a look - was quite a nice example - but decided it isn't the car for me. Tourerfogey wrote: Went to have a look - was quite a nice example - but decided it isn't the car for me. You will know the one when you see it, someone shouts MINE, you look around and you are alone. takestock wrote: thermostat quickly up to temp and Alternator charging correctly, both a absolute pig of a job seemingly. These engines take an age to warm up at this time of year with or without a good thermostat - only way to check Thermostat is ok is to use the diagnostics in the trip to see what temp it gets up to. At 60k you could have problems with the MAF (Mass Air Flow Sensor) - check if the car runs better at low revs with it unplugged. These diesels run very clean - so check for black sooty smoke from the exhaust - might be a block EGR and/or PCV might need a clean. Funny people mention about thermostat issue with the Diesel. When I was looking for our 75 / 75's I looked at a 03 plate diesel with I think it was 168,000 miles Blooming thing would not warm up even with a thrash down the dual carriageway. The heater was blowing cold and thats one thing I hate about a car (is a cold heater in the winter) its got to blow HOT within 5 mins or so. It blooming put me off it did, oh! along with the whistling from the engine and one of the rear door locks broken and not forgetting the high millage. What should I be looking out for . . .